Sad dispatches from Flavortown today, as Eater reports that Guy Fieri’s Times Square family feedbag, Guy’s American Kitchen & Bar, will be closing up shop with the new year. News reports remains unclear on what will be done with the restaurant’s remaining supply of donkey sauce, as well as the still-living donkeys who were presumably waiting to be turned into the next, once-inevitable-seeming batch. Fieri, presumably, is taking the decision with the same cheerful friendliness that has marked so much of his career, no matter how many awful things we say about his hair, or his shirts, or his tendency to sell food items with names like “Volcano Chicken” or “Motley Que Ribs.” He does, after all, still have numerous other restaurants (including two other Kitchen & Bar restaurants, in Las Vegas and Boston), and a billion TV shows, and his extensive charity work, to keep him busy. No time, then, to weep over a dying dream, a place where pretzel-crusted chicken fingers grew on trees, and the Crazy Hagar cocktails flowed like wine. 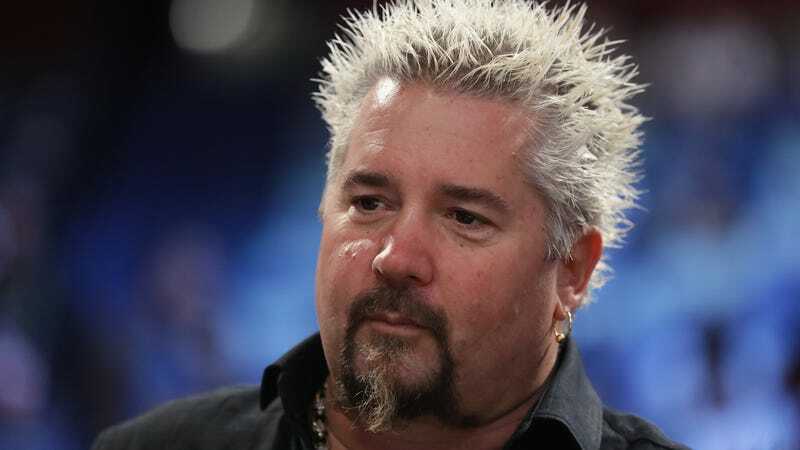 Flavortown, after all, is not a place, we imagine him reminding himself, but an idea, one that lives forever in the breading-clogged hearts of the people who made it real. And ideas are always bomb-dot-com.